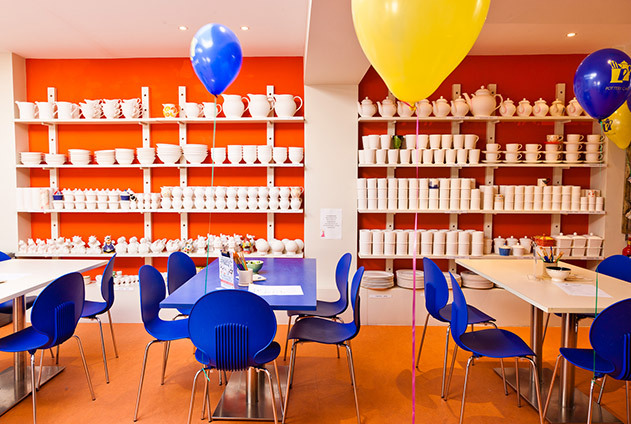 Choose from our menu of handmade English pottery, select your paints and sponges then roll up your sleeves and have a go! Some 92% of our pottery is handmade in England – either by Emma Bridgewater in the ‘English Potteries’ in Stoke on Trent, or at our pottery on the Isle of Wight where we make over 15,000 items a year. A studio fee of £6.99 is charged per person, per session, to cover all materials (paints, decorating sponges and a short demonstration if needed) plus glazing and firing of all items decorated that session. The studio fee is per person, not per item. The cost of the pottery is then added at the end of the session. To view the prices of our items, select your pottery from our range below! At the end of your session, you leave your pottery with us to be glazed and fired. You will be quoted a date for collection of your finished item(s) which is normally around one week later.